Hello there, I am Dr Donna Chow. I am mummy to 3 important boys in my life – Kandon, Mindon and a mini schnauzer named Ah Bee. I graduated with a M.B.B.S from National University of Singapore. I did two post graduate diplomas in Family Medicine (NUS) and Practical Dermatology (Distinction, University of Cardiff). Currently, I work as a doctor with an established aesthetics clinic in Singapore. I live a fairly hectic lifestyle juggling my roles as a mummy, a blogger as well as a doctor. In my free time, I love online shopping and hope to share with you great buys and bargains which I have chanced upon. I am a handicraft person as well – you may find some of them being featured on this blog such as my tutorial on how to sew a simple square blouse, DIY baby gate using fabric paint and how to sew a bow tie. Currently I have no maid – I do most of my housework on my own; with the help of my husband. I feel very zen living without a maid (really!). Doing my own housework is a good form of work-out. Besides, nothing beats the happiness of being in control of the household rather than rely on a domestic helper. Occasionally, I share my cooking and recipes as well. If I do cook, I prefer simple meals which can be accomplished by as few as ingredients as possible. Check out my 3 ingredient sponge cake recipe and baby cereal pancake recipe. Some of the aesthetics topics I have shared on includes: Hair removal – laser or IPL and How you should treat your pimple scars. You can check out the aesthetics tag for more of these topics. 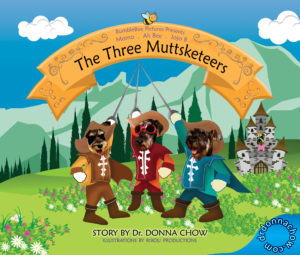 My latest project is the publication of The Three Muttsketeers (a children’s story book) for animal charities. This book is inspired by my pet dog, Ah Bee, who is the protagonist in the story. I am pretty excited by this book project because it is a new arena that I am stepping into – the world of self publishing. Click to view my Amazon Author Page. I am happy to say that I started this domain name and blog by myself – without any external IT help or vendor. I see blogging as a hobby and also an avenue where I can share my journey as a mummy, an aesthetics doctor and my handicraft projects. I get featured by the media a couple of times – you will find the articles here. If you wish to contact me regarding any mummy related stuff, media interviews, product reviews or sponsorship, please fill up the contact form on my main page. You will be able to find my email on the page too. Thank you for reading my posts, do send me a like on my facebook page!